SINGER® Sewing Company and CRAFT Magazine invite all of the crafty stitchers out there to create a project inspired by nature. As we look forward to the spring, with the new growth and beauty that it brings, we ask you to create something that is sewn using a sewing machine and integrates organic elements for our Sewing with Nature Contest. For a four-week period, crafters can submit pictures online of their nature-inspired projects to the Flickr group called 'The Sewing with Nature Contest'. At the end of the four weeks, SINGER will pick one Grand Prize winner and three runners-up. The Grand Prize winner's project will be featured in the SINGER® ad in the Spring issue of CRAFT Magazine. The Grand Prize winner will also receive one (1) SINGER® Confidence 7467™ sewing machine with a retail value of $350 and a set of SINGER sewing books courtesy of Creative Publishing ($60 value). Three (3) runners-up will receive a SINGER® dress form ($129) and a subscription to CRAFT Magazine! Head on over to the 'Sewing with Nature Contest' Flickr group. Full contest rules and information are here. Did you know that this month is National Sewing Month? Check out the website for ways to celebrate, including projects and ideas for sewing green. September is National Sewing Month and it’s a great time to indulge your passion for sewing or even to introduce yourself to the art if you’ve never tried it before. A smart place to start is with your local chapter of the American Sewing Guild. Enjoy monthly meetings, stitch-ins, workshops, seminars or the popular annual conference. Just learning to sew? You can search for a Trained Sewing Instructor in your area or enjoy some of the many free sewing projects and articles available on www.sewing.org. You can celebrate right here with us at Pimp Stitch by following the blog and by stitchin' up some pimp-a-licous patterns and uploading them to the Flickr group! First, there is The Caffeinatted Collection, a coffee lover's delight! Three warming images of your favorite beverages. Then there is The Breakfast Club...not the movie, the real deal! Fry up some bacon and eggs or enjoy some flapjacks and syrup. Either way you go, it'll make you say "Yum!" So pop on over to Amy's shop and see what she has in store for you this week. Pattern Release :: It's Christmas Time in August! This is the last week that all of us girls will be releasing together. Next week we go to our individual release schedule where only one designer will release each week. So take advantage of the plethora of new designs from all 4 Pimp Stitch designers this week. 8 new patterns, more than half of which are Christmas inspired! We're rolling out new patterns this week from all of our Pimp Stitch Designers. This week we have a smattering of Christmas patterns as well! 8 new patterns all with a Halloween theme to adorn all of you spooky*cute decorations! Tiny Yarn Animals Releases August 5th! 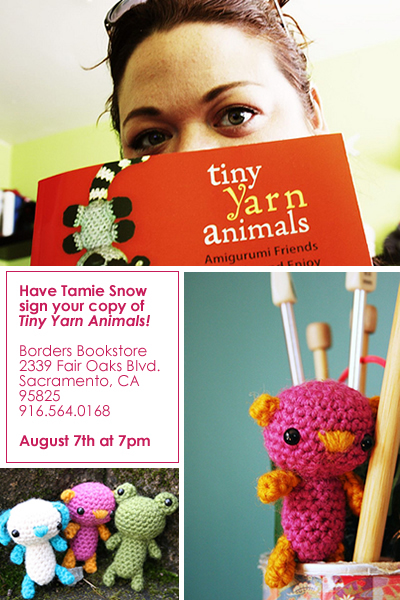 Have Tamie Snow of Roxycraft and Pimp Stitch sign your copy of Tiny Yarn Animals! This Thursday, August 7th at 7pm! Thank you Amy for the graphic!